Please turn in your fundraising forms ASAP. I need to send them in no later than Wednesday to Century. I can still take sheets after that time, but they will be listed as "late orders" and are much harder to send in and to sort when they arrive, so I would prefer to get all order sheets in by that time. If you have any questions, do not hesitate to contact me. Sales so far look good all things considering. I'll have a report on what our anticipated profit is sometime Wednesday. If you are considering making your good-faith donation in lieu of selling, please do it as soon as you can. 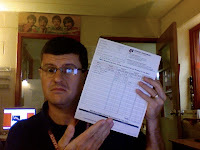 Make checks payable to "Fairbanks Band" and please put your donation in an envelope with the student's name and hand to me directly. Thanks to everyone for their support and effort on this big fundraising effort. We appreciate it!